Flip Out Mama: Wanna Open A Business? 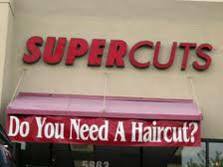 How About A SUPERCUTS? Supercuts is the #1 Hair Care Franchise, and the #5 OVERALL Franchise opportunity available in the USA! I would like to own my own business one day, and I never really considered a hair care franchise until reading about Supercuts. It really makes a lot of sense, and seems like a great business idea. If you would like more info on opening a Supercuts franchise, just click here! Disclosure: I wrote this post in conjunction with a campaign for MomFuse. All opinions are my own and no monetary compensation was given, although I was given a "Regis Gift Basket" to compensate for my time.